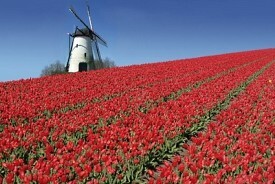 Cruises from Amsterdam depart from late spring through early fall. This vibrant city in the Netherlands, lining a maze of canals, offers endless surprises. The top shore excursions here visit the world-renowned Rijksmuseum (it houses Rembrandt's "Night Watch"), Dam Square and the Royal Palace. In spring, the tulip gardens are a favorite destination. The Anne Frank House and the Heineken Brewery are open for tours. From Schiphol International Airport to pier: Exit the airport and take A4 to Amsterdam and then the A10 Amsterdam ring road (north). Leave the A10 Amsterdam ring road (north) at the S114 junction (follow the signs Centrum, Zeeburg and Artis). Turn left at the end of the exit road. Follow the road until you have passed the Piet Hein Tunnel. At the end of the tunnel turn right, following the signs for 'Centrum and Central Station'. You will pass three traffic lights; after the third light, turn right at the second access road. Entrance to the underground parking area is situated in front of the terminal. Pier Long Term Parking: Parking is located underneath the Passenger Terminal Amsterdam (PTA) Daily rate is approximately 16 Euros for cruise passengers and is subject to change.